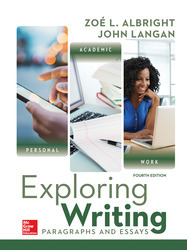 Now in it's 4th edition, Exploring Writing emphasizes writing skills and process. By referring to a set of four skills for effective writing, Exploring Writing encourages new writers to see writing as a skill that can be learned and a process that must be explored. The four skills, or bases, for effective writing are as follows: Unity, Support, Coherence and Sentence Skills. These four bases are essential to effective writing.